"Edwards used the harsh lessons learned that night to take his chance at the second time of asking"
Eddie Hearn for Matchroom Sports provides boxing fans with a stacked card at the Copper Box Arena in Stratford, London on Saturday with the pick of the night's action screened live on Sky Sports. 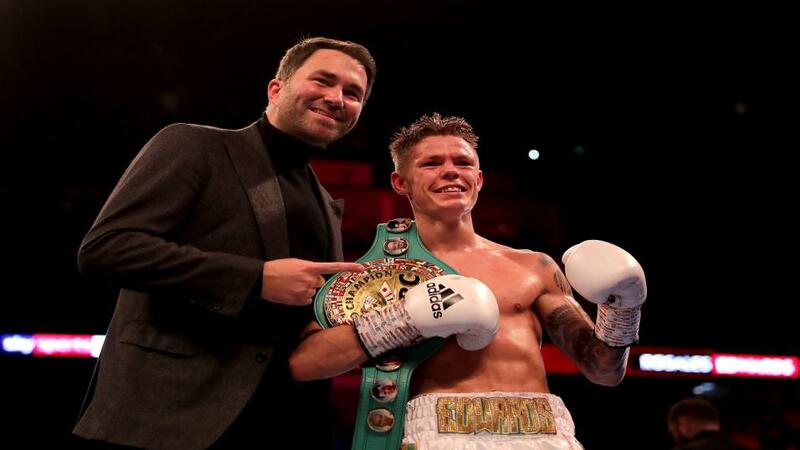 Charlie Edwards defends his WBC flyweight world title against Spaniard Angel Moreno in a top-of-the-bill battle as the Surrey native looks to continue his fairytale. The pick of the undercard pairs Joshua Buatsi and Liam Conroy for the British light heavyweight crown after followers get an update on the careers of Lawrence Okolie, Wadi Camacho and Lewis Ritson. A night for the purists but Betfair traders ensure there's enough in the betting to give casual followers of the fight game an interest. Englishman Charlie Edwards enjoyed a spectacular end to 2018 when coming out of the year a world champion. The 26-year-old realised a career-long dream in only his 15th fight when beating Nicaraguan Cristofer Rosales on points over 12 rounds at the 02 Arena on the undercard of Whyte-Chisora to take his professional record to 14-1-0. That victory earned him the WBC flyweight title, the scorecards returning 116-112, 118-110, 117-111, proving him a deserving winner of the belt. Edwards' sole defeat to date came early in his career when stopped in 10 rounds by Filipino John Riel Casimero back in the summer of 2016 with the IBF world title on the line. The beaten man received credit for a gutsy performance and although it looked to have come too early in his career, Edwards used the harsh lessons learned that night to take his chance at the second time of asking. He's hot favourite to make a successful defence with [1.03] trading on the Betfair Exchange. The Sportsbook has him priced at 3/10 for another points win, but 11/4 for a KO/TKO looks better. Challenger Angel Moreno is the more experienced fighter with 23 bouts already under his belt, but he brings a record of 19 wins against two defeats and a couple of draws and that has him rated outside the top 30 in the world by boxrec, although he does stand as number one Spaniard. The 35-year-old from Madrid hasn't fought over 12 rounds since 2016 and on that occasion, he was beaten on points by Frenchman Thomas Masson for the European title. Moreno makes a massive step up in class for this bout but it's difficult to work out how he has earned it with each of his last three fights being six rounds, his last two going the distance. Angel is on a nine-fight winning run, but it has come in lower level company than he'll face here and It's easy to see why punters are dead against him. Backers looking for a big price upset can back the strap heading back to Spain at  on the Betfair Exchange. Not enough to tempt us. Ghana-born Londoner Joshua Buatsi looks to move his CV to 10 wins from as many starts when sharing a ring with the experienced Liam Conroy of Cumbria in a bout that will decide the short-term future of the light heavyweight Lonsdale title. The 6ft 2inch orthodox has won seven of nine inside the distance and if he continues his form here he'll surely be fast-tracked towards bigger and better things. Buatsi was last seen taking Renold Quinlan out in a round and that was his third win in-a-row that has come in the opening three minutes. He's [1.04] on the Exchange to take his tally into double figures and he's expected to do it without calling on the scoring judges. A win in the first six rounds looks likely, although Conroy's experience will see him set-up more defensively than most. The underdog takes on this challenge having won 16 of 20, his tally also showing three defeats and one draw. Conroy was stopped in a round by Cello Renda early in his career in the Prizefighter middleweight quarter-finals and that does nothing to inspire confidence when in with a proven puncher at a higher division. Punters make the Cumbria scrapper a  no-hoper. Harsh, but we'd be surprised to see him go close to halting Buatsi's progress. An old friend of mine, Wadi Camacho and I went through the amateurs in the Peacock Gym, Canning Town and across the street in the former TKO Gym as pros, but he does look to have a real job on his hands here. The Barcelona born Machoman is a good boxer with the power to cause trouble and he carries a dozen knockout wins into this one. The 6ft 3inch southpaw also loves a scrap, however, and that could cost him dear when facing Lawrence Okolie who has claimed eight of his 11 wins by KO/TKO. The Hackney orthodox stopped Tamas Lodi in three last time and has won two of his last three bouts inside-the-distance. Wadi is a step up in grade from that, but I don't see this one getting anywhere near the 12 rounds scheduled. Both men are on a run of stoppage wins and you'll get 2/5 on Okolie by KO/TKO, or 22/1 Camacho to make his power pay.